18k yellow gold ring, crafted by Green designer Ilias Lalaounis, set with emerald, ruby and sapphire gemstones. Ring size - 7.25, ring top is 24mm wide and weighs 8 grams. Marked A21GR, 750, Lalaounis hallmark. 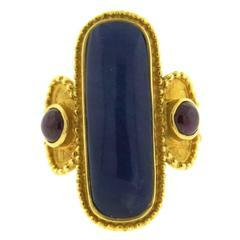 An 18k Yellow Gold Ring with Emeralds, Rubies, and Sapphire by Lalaounis. Made in Greece. Size 7.